Our friends at the resort shops want us to keep fit this season, all while enjoying our wonderful backyard. The dynamic team of coaches from Aquaclub La Source, Lolë brand ambassadors and racing enthusiasts from the Solomon boutique and Magasin de la Place have developed a weekly calendar of activities for all tastes. 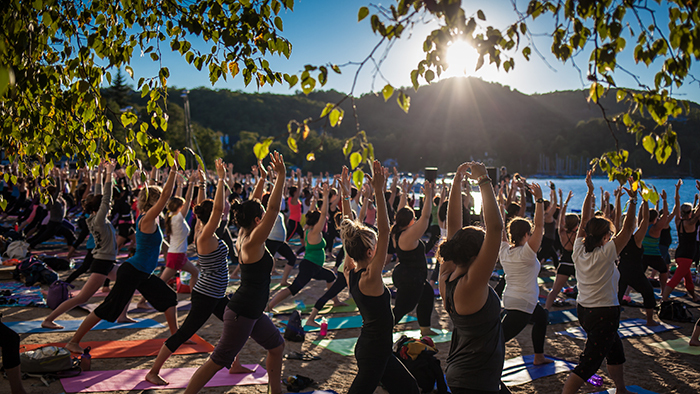 Stretching on the beach at sunrise … A great way to start your day! In addition Stretching on Sunday mornings, we invite children to join the yoga class on Saturday mornings at the beach for a “Kids Yoga”! Fan of Zumba? The La Source team makes us move to a Latin beat every Wednesday evening, Friday afternoon and Saturday morning. 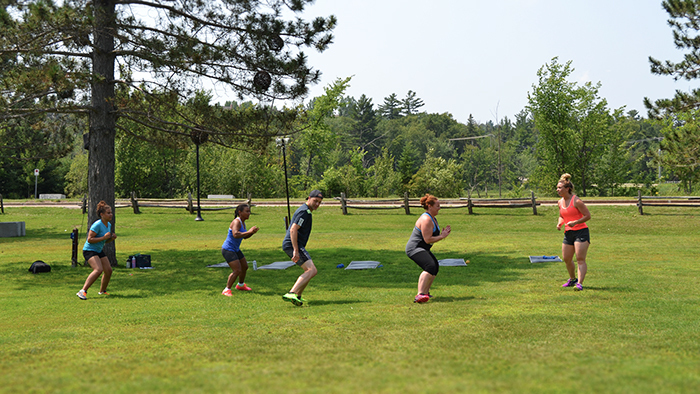 For a full body workout that will touch all your muscle groups, join the Bootcamps Monday at noon and Thursdays at 5 pm. The Tremblant Lolë boutique also offers many courses year-round with their brand ambassadors. They give yoga, Zumba and cardio classes. Follow their Facebook page for details on upcoming events: www.facebook.com/LoleTremblant. 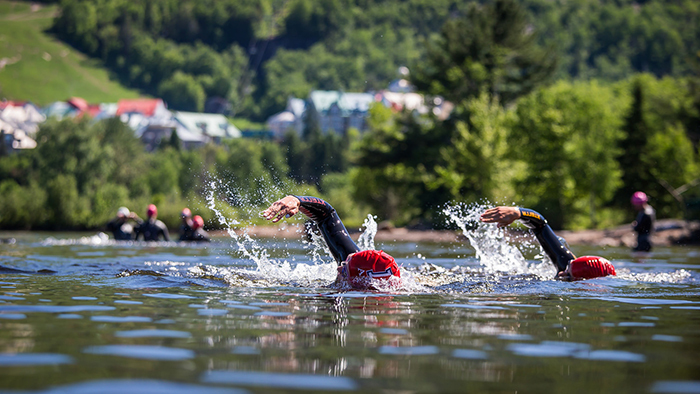 For those in training for a triathlon, looking for new fitness techniques or simply for water sport amateurs, La Source offers supervised swimming sessions and AquaCrossfit lessons. They offer a group swim on Mondays and Wednesdays from 7 am 30-8: 30 pm in the pool at the Aquaclub and Fridays at the same hour at the Beach and Tennis Club beach (weather permitting). 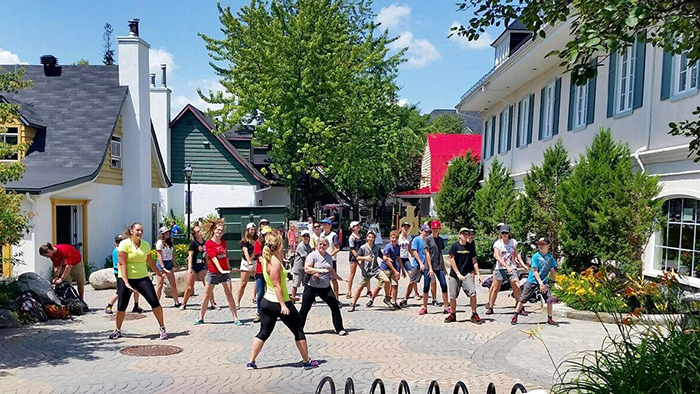 The Tremblant Salomon shop offers group running outings each Wednesday and Friday in the beautiful trails that surround the pedestrian village. Each session includes a trail running outing of 4 to 8 km and various exercises. 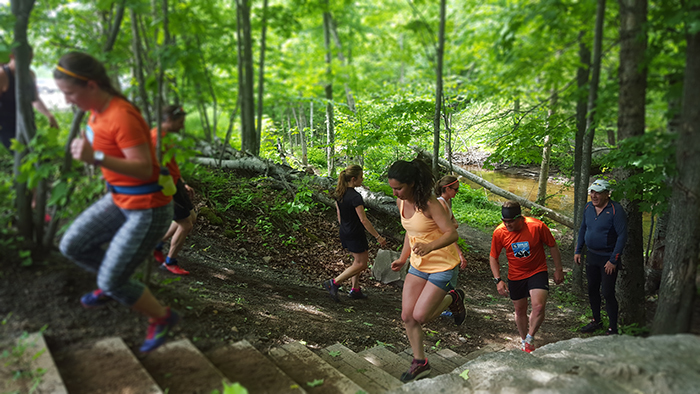 Coaches adapt the runs according to the participants and offer specific advice for running in trails. The trail running season ends on October 23rd, the eve of the Salomon Classic! 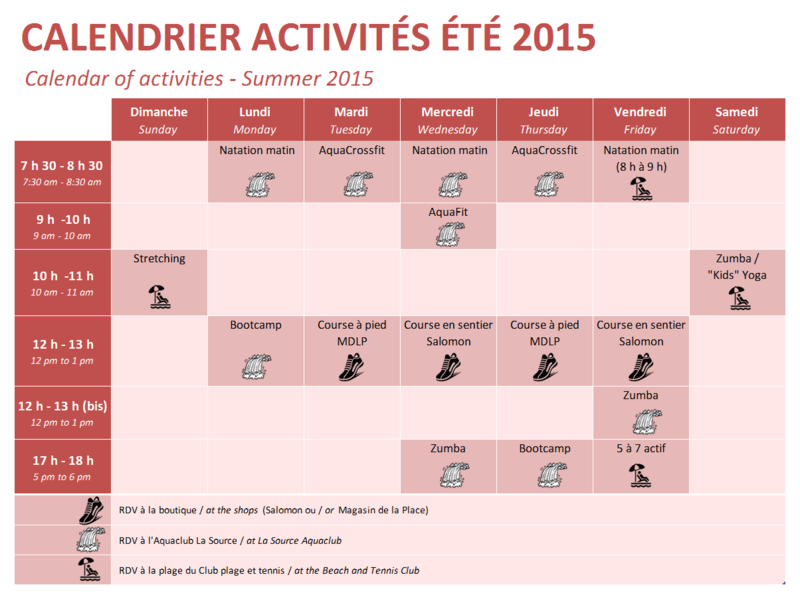 The Magasin de la Place Running Club offers group outings every Tuesday and Thursday at noon, around the resort. Each session includes advice on running and run between 3 and 6km. Coaches adapt each outing depending on the level of the participants and where they are in their training program. In addition, the Magasin de la Place is proud to have specialist François Belle Isle present every Thursday. François shares his expertise and offers some tips and tricks to help you achieve your goals. 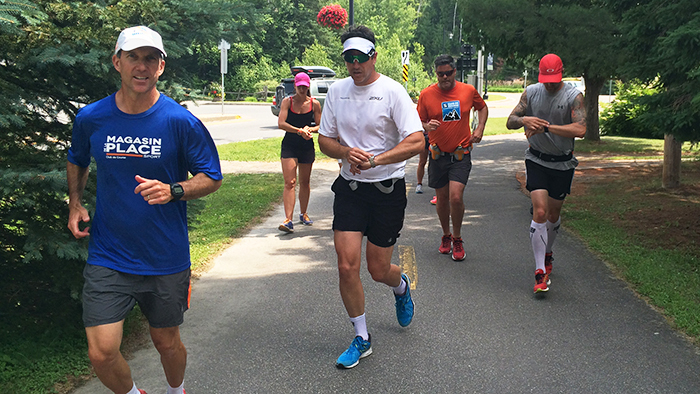 The club runs weekly until August 6, 2015, in time for the Mont-Tremblant Half Marathon! Every Friday from 5 to 7 come join us at the Beach and Tennis Club for an active happy hour! 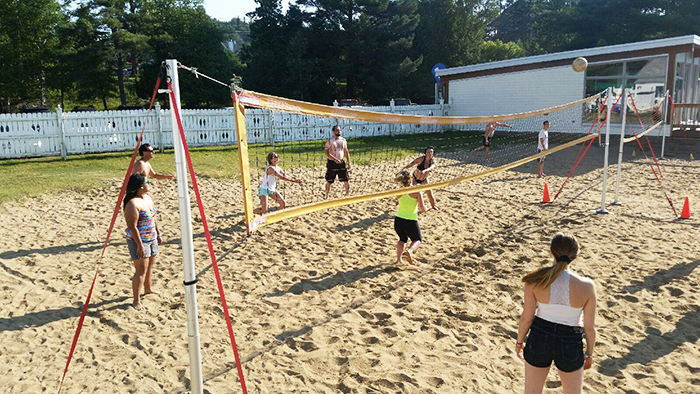 Join your social side to your fitness goals with activities such as beach volley-ball.